Someday people who use motorized wheelchairs, but cannot steer them mechanically, will be able to operate them with their thoughts. We've seen this idea tested in the lab, now we see a working model in action. 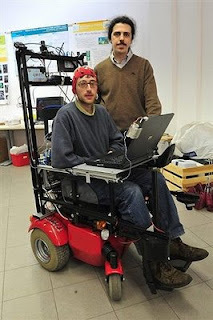 The wheelchair driver wears a skull cap populated with electrodes and sends signals through it by concentrating on where he or she wants to go, choosing from a selection of destinations displayed on a screen. The list includes, for example, kitchen, bedroom, bathroom, and so on. In a matter of seconds, the chair heads for the chosen destination. The program contains a plan of the house but also uses laser beams in order to avoid obstacles. Wheelchairs equipped with this kind of thought-command system could be on the market in ten years, according to the developers. They are expected to cost about 10% more than standard motorized models.